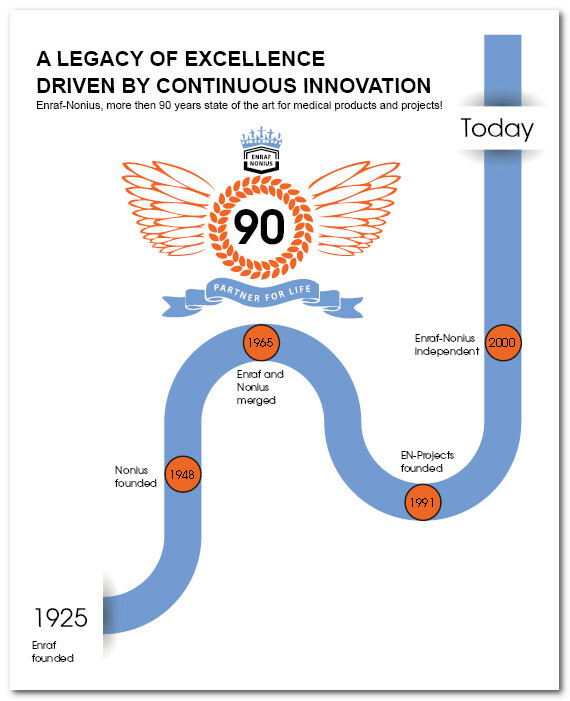 Enraf-Nonius, over 90 years state of the art for medical products and projects! 2015 was the year in which Enraf-Nonius celebrated its 90th anniversary and we proudly look back on our history and we are excited to learn about our future. For decades already Enraf-Nonius is market leader in the world of physiotherapy and rehabilitation and for turn-key medical facilities. We were, are and will be the proud supplier of excellent products and optimal healthcare projects, worldwide. It is a true legacy of excellence driven by continuous innovation. As an offspring of the Delft University of Technology (the Netherlands) Enraf-Nonius started with products for X-ray applications and with equipment for diathermy. Shortwave devices for physiotherapy and rehabilitation were manufactured since the company’s founding in 1925. Experience gained over many years, craftsmanship, the alliance with universities and experts and our world-wide network of distributors have all contributed to the success story of Enraf-Nonius. The Dutch mentality of global thinking and consideration for local demands lead to innovative products and services. The Dutch design is appreciated worldwide! Motivated by a passionate interest in movement, Enraf-Nonius has been developing products for mobility experts and is now the global specialist for physiotherapy- and rehabilitation products. Our range of products comprises high-, low- and medium frequency devices, equipment for ultrasound, EMG, shockwave therapy and laser therapy, as well as treatment tables, traction-, suspension-, exercise- and measurement equipment and thermo therapy units. Enraf-Nonius has designed and manufactured these physiotherapy products and can boast of an extensive installed base in over 100 countries. Today SONOPULS, ENDOMED, CURAPULS, MYOMED and MANUMED, are considered brand names and are known world-wide. With EN-Projects Enraf-Nonius offers turn-key medical solutions. EN-Projects not only realizes hospital and rehabilitation projects but also offers procurement and project management. Enraf-Nonius and EN-Projects are complementary in their objective to improve healthcare on a global level, now and in the future! Nowadays users of Enraf-Nonius products can be found from Amsterdam to Tokyo and from Alert (Northern Canada) to Antarctica. These users are supported by an excellent global sales and marketing network. Wherever you are, there always is an Enraf-Nonius partner nearby to help you with up to date product information and with service capabilities. Enraf-Nonius products are designed in accordance with the most stringent requirements for use and safety. Being supplier to institutions and professionals in the medical field, Enraf-Nonius is well aware of its responsibility. Sense of quality is embedded in the Enraf-Nonius organization. Enraf-Nonius has always been characterized as market leader in the world of physiotherapy, with its unprecedented quality equipment. The basis for our unparalleled success formula was established in the past: the coming together of expertise, the delivery of quality and customer orientation. With a dedicated in-house Research & Development department we will continue to design and develop equipment according to customer’s demands and the latest developments in the scientific field. Enraf-Nonius provides the top in the field of physiotherapy equipment for many decades already, and from this background, as well as from our passion for technology and motion, we look forward to supplying the world with state-of-the-art products. Enraf-Nonius will continue to work to help improve the quality of life of all people. We are proudly progressing for 90 years already and for many years to come!